John Cahn has had a profound influence on the course of materials and mathematics research during his forty year career. The foremost authority on thermodynamics since J. Willard Gibbs, Cahn has applied the basic laws of thermodynamics to describe and predict a wide range of physical phenomena. 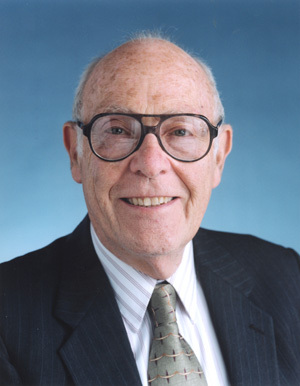 Cahn is most widely known for his pioneering work on the thermodynamics and kinetics of phase transitions and diffusion, on interface phenomena, and for his discovery, along with Shechtman, Blech, and Gratias, of a quasi-periodic solid known as a "quasicrystal." A member of the NIST staff since 1977 and a Senior NIST Fellow in the Materials Science and Engineering Laboratory since 1984 , Cahn has played a critical role in the scientific life of our organization. His unwavering insistence that scientific work be compatible with the fundamentals of thermodynamics has greatly strengthened the rigorous scientific underpinning of research throughout NIST. In his search for knowledge, John has reached out to scientists in diverse fields and has stimulated them to work on a broad range of materials problems. The solutions to these materials problems have led directly to the creation of modern, multifunctional materials.